I'm about to go all marmite on your asses. You're about to either dive wholeheartedly into this post or turn off altogether, because I'm about to use the K word. KARDASHIANS! A few seasons back on Keeping Up With The Kardashians or KUWTK for us die hard fans, something happened. The fam moved on up out of their humble (ish) beginnings and into a snazzy new mansion. Gone were the tacky gold curtains and beige, beige, beige, and in came style, sophistication and class. Khloe, Kourtney and Kris seemed to have a universal style theme running between all of their homes and boy I liked it. Apparently Kris even loves monochrome so much that she has black toilet paper. I NEED THIS IN MY LIFE. I did a bit of research and found out the designer is Jeff Andrews, who has designed homes for the likes of Michael C Hall (Dexter) Ryan Seacrest and of course the lovely Kardashian ladies. What I love most about Jeff's work is his talent for using a variety of textures and print and somehow getting it all to work in one room. I love the sparing colour schemes and dark, glamorous rooms. They kind of remind me of a really sultry hotel. Not all of his design work is like this, some is a lot more muted, and that I'm not really a fan of. But the Kardashian homes are pretty much ticking all the boxes for me. Jeff and Kris share a laugh over something impossibly funny! Kris Jenner's hallway. Not a bad sight to get home to each evening hey? Kris Jenner;s Dressing room. I want to do my makeup here! 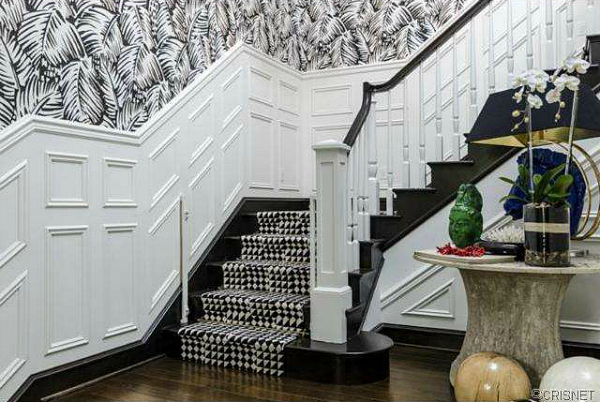 Kourtney Kardashian's staircase / Hallway. Love the panelling and carpet! Kourtney Kardashian's Living Room area. The armchairs people, the armchairs! TO. DIE. FOR. What do you think, love or hate?